The Twitter social networking experiment has ended ! I am doing a Twitter social networking experiment to see if I can spread the news about the availability of Photo+Map in the AppStore. The experiment ended on friday 6/12/09 at 5pm California time ! Below are the steps to participate in the experiment. sync, or download it directly to your device. this with a photo from your library or by taking a new one. verify when you complete step 5, below. 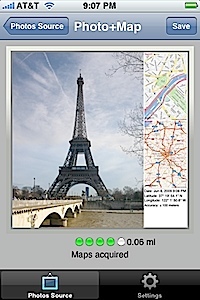 "Get a free copy of the new iPhone Photo+Map app : http://tr.im/nWW1 for details"
That's it ! The first 10 users to email me a photo+map and then retweet the message will receive a promo code for the full version of Photo+Map !